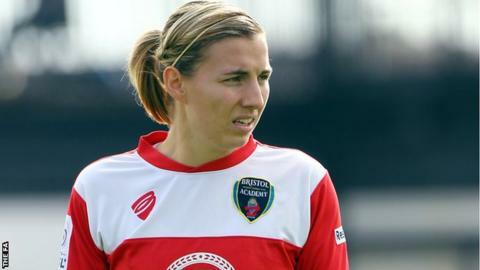 Bristol Academy captain Grace McCatty says she is playing for her future after boss Dave Edmondson was sacked. Edmondson made the 25-year-old skipper this season despite the fact she will leave the Women's Super League side mid-season to volunteer in Zambia. The Vixens will name their new boss on Tuesday, with the defender having two games left to try to help the league's bottom side end their winless run. "These two games I'm showing I deserve my place at this club," said McCatty. "When I come back, now Dave is gone, I'm unsure who the manger will be and if I'm honest I don't know what my place will be at the club. "I might come back and not be captain. For me, it is really important that I go out and give a good show of myself and lead the girls as best I can. "When the new manger looks at the results and performances and I'm then going away, there is three months that I can't prove what I can do." Bristol Academy are next in action on Wednesdays against Birmingham City, the only other top-flight side that is yet to win a league match this season. The Vixens have lost all seven games to date, been knocked out of the Champions League and FA Cup, and have now conceded 27 goals and scored just four. McCatty is determined to leave Bristol on a high when she takes her break next month. While the Vixens suffered their seventh defeat in all competitions on Saturday, going down 5-2 against Notts County in their first game since Edmondson's exit, the defender says there is reason to be positive. "There are snippets, the first 15 minutes of the second half when we got two goals in quick succession to put us back in it was positive," she said. "It was a bad result but there are those positives and we can build on it. "We've seen that we can score goals and compete. If we do it consistently we give ourselves a chance, but at the moment we are gifting other teams that victory. "I'd love to go out and get two wins so I know I played my part."